As part of our evolving investment strategy at Forward Partners, we are increasingly interested in applications of Artificial Intelligence (AI) across a number of verticals. The aim of this post is to share some Do’s and Dont’s when building an AI startup. If you’re working on Applied AI, please apply to our AI Office Hours, we’d love to hear from you! (Not) another AI primer: For those not familiar with it, you can get up to speed on the latest trends by following investor blogs, microsites and newsletters. A quick introduction to the potential for AI technology and how it differs from data science and machine learning is described in this video, but the crux of it is that AI turns human intelligence on its head. For example, a human would need to develop a hypothesis, assuming a relationship between variable (x) and its impact on outcome (y). They would then need to test whether this is in fact an accurate predictor of the outcome they are observing - typically using a good old-fashioned regression model - to determine causality. In contrast, AI makes it possible for computers to take the same set of data (+ add more unstructured data to it), to then tell us what are the salient features and/or the relationships between them. Machine learning therefore replaces the need for humans to infer by giving computers the capacity to learn on our behalf. Deep learning is where multiple machine learning models are aggregated, one on top of the other, providing enough data to train and test computer-generated models that can observe complex patterns between sequences. How can the next wave of startups leverage these trends? While we are starting to see idea stage founders using AI as an enabler for their business, for most startups currently at seed stage and beyond, it is the fundamental economic value behind their product or service. Regardless of your focus or what stage you are at, we have compiled a list of Do’s and Don'ts to consider when following an Applied AI strategy. We hope it is useful! This point about looking for “10x” improvements as opposed to marginal gains is becoming horribly clichéd across the AI space, but it is worth addressing. Founders face several challenges in living up to this benchmark when Applied AI solutions often end up being incremental at best. To over come this, look for applications where the core benefits or attributes of Artificial Intelligence technologies suggest a significant step-up in the category or current solution to which it is being applied. For instance, if you are working on a machine-learning bot using natural language processing to execute more efficient Q&A, think of the most common pain points in human-to-human interaction. Customer service can be painful for consumers and expensive for businesses, hence bots that enhance customer experience pose an obvious use case. Going one level down, traditional retail banks whose user interfaces are limited and customer service teams are particularly inaccessible, present a good opportunity for a bot that plugs into personal banking portals/data whilst providing additional value by helping you track your saving or spending habits. Back to the old problem of tech push versus market pull, there is no easier way to spend a lot of time (and money) than developing cutting-edge AI technologies without first thinking about their applications. 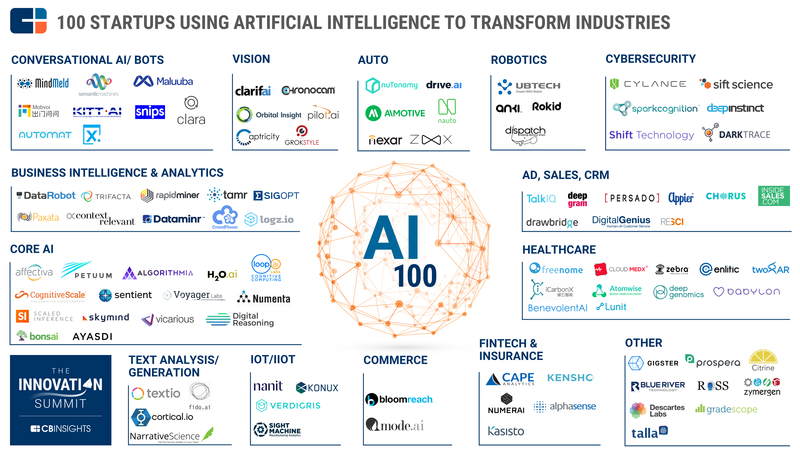 While many AI startups have been built and acquired (see below) based on technical capabilities and a passion for the promise of AI technology, they have had clear technical applications. That said, the next wave of AI startups will be industry specific and use-case first. Microsoft Azure is the closest thing to machine learning as a service, providing an impressive suite of tools for you to build your own models and applications on top of existing libraries in a simple and intuitive way. Similarly, the analytics package built on top of IBM Watson lets you throw data at it and it throws back insight. Scikit-Learn is an open source library for advanced analytics in Python, such as carrying out classification, clustering or regression. Combined with matplotlib, it can produce some powerful insights and visualisations. TensorFlow is Google Brain’s (recently open-sourced) software that enables you to carry out deep learning on your data through graphically represented neural networks. To see it in action, check out some of these awesome videos. Apache Spark combines your existing workflows in Python or SQL to carry out analysis on larger datasets. If you are working on tasks requiring natural language processing (parsing, sentence segmentation or speech recognition for sentiment analysis) Apache Open NLP also offers a great toolkit. In the same way cloud platforms and services were dominated by giants such as Oracle, IBM, Amazon and Cisco, AI infrastructure will remain the preserve of leading engineers at Google, Microsoft and Amazon (not to mention an army of researchers working on open source solutions). If the solution already exists, why try to close the circle? Better to build on top of it. Data is everywhere… at such an early stage you may simply be considering how to build the data architecture that supports possible AI applications. However, if you want to get cracking sooner, why not come up with more creative ideas around building datasets through APIs into open source or useful, paid-for databases. Better still, why not explore the potential for mutually beneficial partnerships and innovative business models that allow access to proprietary or hard-to-access data. If you are focusing on this, you are probably late to the party… There have been some impressive exits following the first wave of research-driven companies (Deepmind and Nnaissence in particular) ‘acqui-hired’ before generating revenues, and the second wave of machine learning infrastructure firms bought soon after commercializing their products. However, the next wave of AI startups will be characterised by the disruption of verticals and value chains. Other investor blogs make a compelling case for solving industry-specific problems specifically by combining AI with subject matter expertise. Consider how you might build out your team to ensure you have the right balance of technical know-how but most importantly product, design and development expertise that can execute the Applied part of your AI offering. Startup principles of speed of commercialisation and product execution remain just as important, and your team has to reflect that. If you aren’t building a product, platform or SaaS offering, then there is high chance you have fallen into the consultancy trap. Startup teams experimenting with AI are often a bundle of sought-after skills and capabilities. While you may be able to sell these at a premium or pose as attractive acqui-hires, you could go after a much bigger prize: Exponential growth. Look out for industries currently leading the charge in AI adoption, which tends to be already highly digital and early-adopters by nature (high tech, telco, financial services) and think about categories where AI can have a transformative impact. For instance, Stanford University identified several including: Healthcare - to enable improved care / diagnosis through advanced analysis and robotics; Education - through tailored learning systems and analytics; Low-resource communities - particularly in planning, resourcing and scheduling tasks; and Entertainment - to create more interactive, personalized and engaging customer experiences. Pick your category and then focus. With low-level task-based AI and AI infrastructure becoming increasingly commoditized by large tech companies, it is even more important to take a step back and look for ‘venture scale’ opportunities in different verticals. Digging into the data on AI startups, two verticals with strong representation are fintech and healthcare, both of which stand out from Machine Learning as a Service (MLaaS) and the broader analytics landscape. Secondly, something that most current AI disruptors (and acquirers) have in common is their focus on enterprise (B2B) applications, which is arguably where the need is strongest and the opportunity is greatest due to the sheer amount of data available to them. What might Applied AI offerings look like across a range of consumer offerings? As a thought exercise, try matching the attributes of different AI techniques to potential market applications and start to sense check these assumptions with potential customers. To summarise, Applied AI represents a fundamental shift from a cohort of startups focussed on technology push ideas, excited by the promise of AI and ‘deep tech’ to one characterised by market pull i.e. putting the use case first. To boil down some of these opportunities and pitfalls, we thought you’d appreciate an emoji-powered 2x2. Chris previously founded growthsquared.io a data science consultancy on a mission to help e-commerce businesses apply advanced analytics to their data and/or operating model. Before that, he was Head of Analytics at Swoon Editions, a business championing the "zero stock, zero lead time” model in online furniture retail. Chris undertook a PhD in organisational economics at Imperial College London, focussing on how public and private organisations structure themselves to deliver affordable energy services to the poorest parts of India and East Africa.